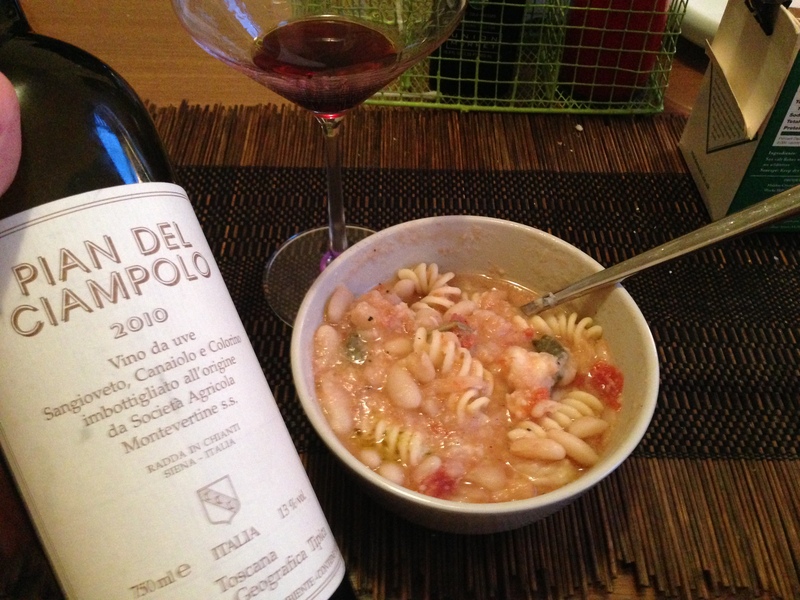 How to Pair Sangiovese and Shrimp – GARGANTUAN WINE. Shrimp and sangiovese sounds bonkers, right? Watch this. Traditional Tuscan fare has been dubbed cucina povera, and it’s indeed rather impoverished and simple with staples including beans, breads and some roasted meats. We all can imagine pairing sangiovese to red meats like steak or lamb shoulder chops, and that’s great. But you don’t always have a place to park that in your innards. Given the ridiculous amount of garlic and sage in this recipe, the shrimp plays second fiddle. Sure, you do taste a briny element of the shrimp, and it’s great, but the rest of the elements envelope it such that it pairs perfectly with sangiovese. And let’s hear it for cucina povera, because this is a pretty inexpensive meal if you source the shrimp cheaply. Plus if you decide you love it, you can tweak the amounts up and make a trough to last for days. “Power soak” the beans: put the beans in a large pot that has a heavy lid, add 3″ water to cover the beans, and bring to a boil. Boil 2 minutes, then cut the heat and let sit covered for 1 hour. Drain the beans. Now in that same ol’ large pot, cover the beans with just over enough fresh water to cover and bring to a boil once again. Add the sage leaves and 6 cloves of garlic, lower the heat so the beans simmer. Smell THAT. Yeah, you see where this is headed. Cover loosely. Cook, stirring occasionally, until the beans begin to soften; add a good amount of salt and pepper. Continue to cook, covered, until the beans are very tender, typically from 20-30 min (because you did your power soak to speed this up). Taste the beans to ensure they’re very tender. Once they are, cook your pasta in a separate pan. Mince the remaining 4 cloves of garlic into the beans and stir a bit; then add the can of tomatoes (juice and all), and the shrimp. Cook another 10 minutes with the lid on and you’re done. You can add the cooked pasta at any point in these last 10 minutes. Now, while portioning bowls out, top with a nice drizzle of quality “finishing” olive oil, more salt and pepper, and Parmesan, then mix away. The olive oil is a vital finishing element that suddenly makes the dish coherent and harmonious instead of watery and disjoint. Very healthy, addictive, and a miracle of a pairing with a brawny sangiovese — it almost feels like necromancy. In addition to speeding up the cooking time, the power soak also seems to help avert nuclear meltdown levels of gas by breaking down a lot of the sugars beforehand; so: win / win.